These days there are many talks on converting fuel cars to some new sources of power: hydrogen or electrical driven, many hybrids appear which use both electricity and fuel. 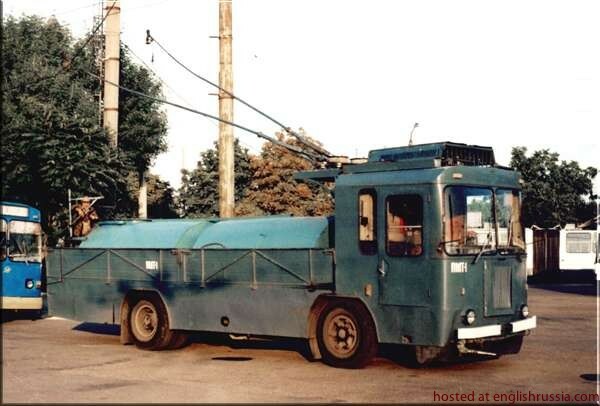 But not many know that already 60 years in some Russian cities there are even big trucks are go solely on electricity without a drop of fuel. The only problem with them they are wired. Yes, connected to the wires which cover all the major streets of the cities so that such trucks and some passengers trolleybuses (which don’t use rails like trams but go just on any surface) are connected. 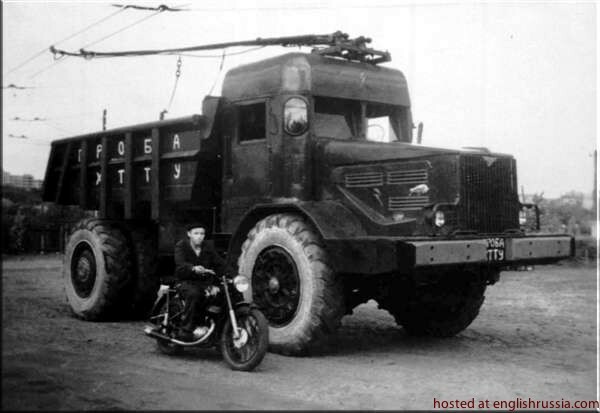 Look at those pics to get the picture of these ecologically safe trucks with 60 years history. I really enjoyed that picture story. I am interested in electric vehicles and had never seen such things. Boston and Cambridge Massachusetts still have electric trolley-buses very much like these. They run on the routes called 71, 72, 73, 75 and Mattapan. However, we’ve been having ice storms lately. The ice coats the wires and pulls them down off the poles. I believe some of that trolleybuses were made in Czechoslovakia. 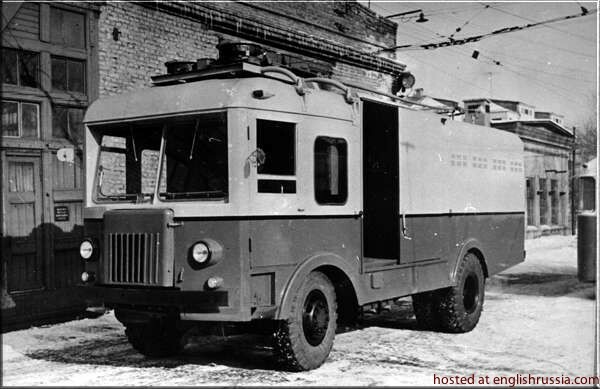 Most of them (trolleycars based on MAZ-205, MAZ-525 – belorussian mining tracks, YaAZ-210E) were developed in Kharkov (Ukraine) by Mining institute, Kharkov trolleybus depot and Kharkov Polytechnical Institute (http://kpi.kharkov.ua). Trolleybuses are neat. They are used all over the place in eastern europe. The only problem is that they have a tendency to sneak up on you. 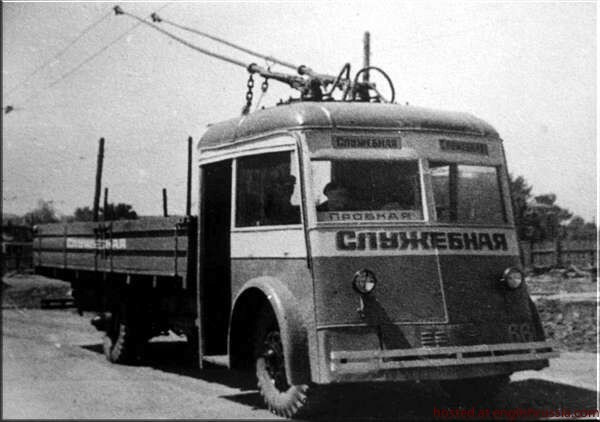 Most of them are maintenance vehicles of the Tram and Trolley Company of the state USSR. Some of those Lorry’s or dumpers are real interesting creatures. By the way, these things are signed as “PROBA” it means those are probation models. Belonging to “XTTY” – can be “Harkovskoje tramvajno trolejbusnoje upravlenije”(Company of Tram and Trolley of Harkov). Electric trucks/busus that take their power from a pantograph must be awkward to drive. I often questioned how enviromentally friendly these vehicles are. If the electricity that is powering these vehicles comes from a coal/oil/or any other fossil fuel power station, then realistically, they are hardly ‘clean’ vehicles. After all, the amonut of power to move beasts like them must be immense. True, but they solve at least one problem, polluting in city centers, where most of the people are breathing the air. +Electric motors usually have very good efficiency, less waste heat is produced. +These things are rather simple technically, I suspect that a trolley bus is weighting less than a regular bus. +I suppose producing energy in bigger quantities is more efficient than in small, when the process can be optimized. Power-station produce electrical energy from the cheapest uranium or from the coal. 1 tonn of coal costs $50 ($2 per 1 GJ) and efficency of electrical energy producing is 40% – wasting on distribution is about 20% – so, final efficency is 32%. Transfer of electrical energy on mechanical energy has efficency about 95%. So energy 1 GJ for the lorry is worth “in coal price” about $6.58 and cost of power-station and distribution of electrical energy – together about $20 per 1 GJ (280 kWh) of mechanical energy. 1 barrel of oil on fuel station cost $100 (in EU whit taxes about $200). So it’s $700 per 1 tonn ($16 per 1 GJ). The real efficency of transfer heat energy on mechanical energy is lower than 25% in car transport. For big lorry on the route it can be 40%. So energy 1 GJ for the lorry is worth about $40 ($80 with EU taxes). Final cost is higher. Troleybus electrical line is, of course, completly usless for usualy car transport. No. This thing is not destined for city streets. It’s for use in coal or diamond careers. But they never actually worked – too difficult and expensive to transport them to the sites and to build the electric infrastructure. I know this car… and I’ve seen it as I see my PC monitor now (not electric, but original one), as I live in Moscow all my life and remember that time, when VDNKh (Exhibition of Achievments of Industry and Agriculture in Moscow) was what it should be. Surely this project is not for city streets, but imagine, how strong the wires should be and what the construction of trolley should be to provide solid contact in conditions of coal career. BELAZ is not fake photo but it did not use wired electricity even if it’s diesel-electric and could in principle be wired. Its ‘trolleys’ are actually removable wire deflectors to let him safely drive inside city toward service center. What happens if they make a wrong turn? In Dnepropetrovsk in Ukraine we have a lot of trolleybusses.If some driver makes wrong turn…what practically doesn’t happen…they get unwired….then it takes about 2 min before the driver wires them again.By the way this and the tram are the cheapest of transport in Ukraine. In my country, Bulgaria, I see them going around all the time. They don’t cover my whole city but they go on part of it. They look exactly the same as other old buses except they are connected to wires above. I don’t think they are making any new ones and as soon as those break down and fall apart, they’ll be gone. At least that’s what it seems like. No, we produce trolley-buses. This is a link to “Trolza”, trolley-bus plant based in Saint-Petersburg, here you can watch the latest models, which are available from Trolza. Trolleybuses are great, i drive in at least 2 of them each working day. The “trackless trolleys” are all over Philadelphia, Pa., and have been so for years. They’re just like buses, except they have those wire things on the back, too. they do make new troleybuses. in Latvia they are very popular, and the city has bought some new one not so long ago. In Seattle, we currently use this system on many of our buses and have for a very long time. Perhaps the west should take more lessons from Eastern Europe, on how be Green!!!! Most big cities run these for their bus and trolley lines, subways use electric power too. Without the taxes the cost seem to be the same however it does lower city pollution which is a major problem anywhere. Electric trolleys were invented at the end of the 19th Century, and it was England that first used them in the form of a bus in the early 1900s. It was a German invented the electric trolley; I can’t remember the name now, but if I do I will drop a line here. VERY interesting. I thought I knew about most of the major developments in electric vehicle history around the world, and I even dreamed up, indepdently, a system for truck trolleys for use in places that had the overhead wires, but I never suspected that this was actually being done anywhere in the world. It makes sense that this would happen in a Marxist economy, because you have the ability to standardize the vehicles, motors, and so on; and to insist on orderly scheduling of truck traffic so as to not have interference to or from the trolly bus traffic. In a capitalist economy, admittedly, both of these issues would impair deployment of the technology. The large dump trucks (tippers) are very obviously mining vehicles. Large mining excavators are already powered by electricity, fed through thick cables to the machines. This system was even used for the biggest piece of movable equipment that has ever existed: the “Big Muskie” dragline used in USA coal production (and since dismantled), that was quite larger than a football field. 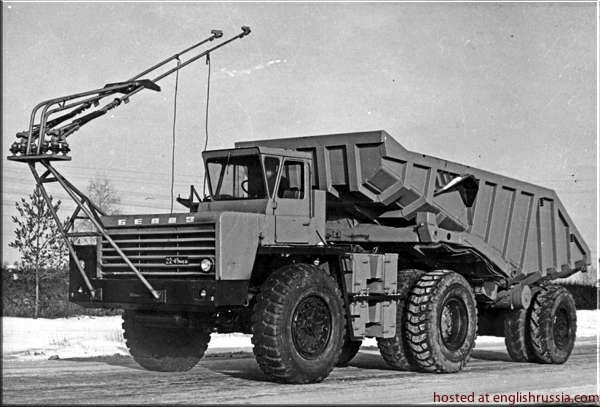 Trollies for mining / quarry trucks, on the other hand completely surprised me. Yet the concept makes complete sense because the driving route is a regular fixed route through the mine. As long as you have access to climate-clean power (nuclear, solar, wind, hydroelectric, geothermal), you can run a sustainable transport system on electricity. All the better when no batteries are needed, or only minimal batteries to enable safely maneuvering when off the trolly line. Here’s to hoping that Russia, now in capitalist economics, doesn’t leave behind this technology and any other ecologically benign technologies that may have been developed (intentionally or serendipitously) during the Marxist period. I am from Christchurch in New Zealand. Looking at this website. 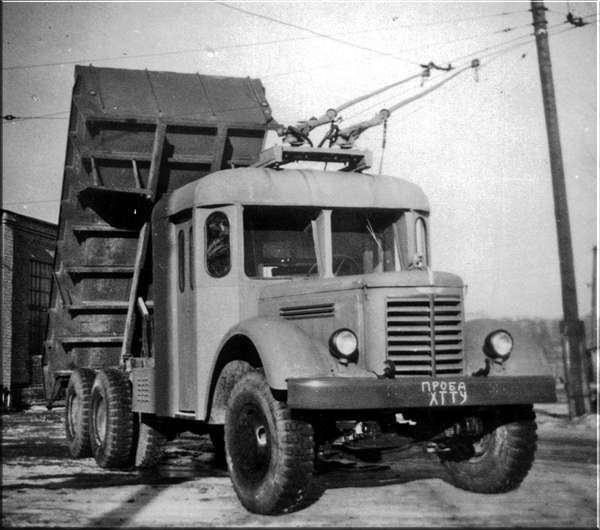 I am amazed by the use of trolleytrucks in Russia. Did not expect to see so many of these. 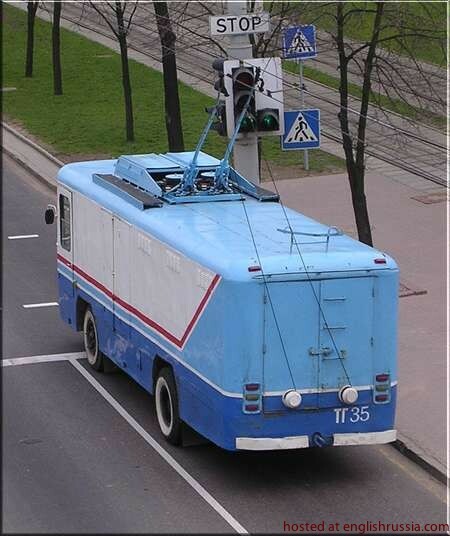 It is great to see trolleytrucks in addition to trolleybuses being used in Russia. Providing that the work is needed to be done where a trolleybus wire is running it works very well and it could well be done in other parts of the world. Great way to keep the enviroment and air clean. The wehicle in picture 2 is probably NOT electrical. In the USA, it depends on the city. Chicago and New York for example, have hybrid buses. Dayton,OH has electric buses(similar to ones shown above. hey guys, we have trolleybus in São Paulo, Brazil too. Then drive all over town here in Arnhem, the Netherlands. They’re painted a characteristic blue to distinguish them from the normal busses (the ones coming in from the countryside). On their roof they have small a backup diesel generator (which is really noisy) that allows then t return to the bus depot at 30 km/h tops in case of an overhead line malfunction. Also there is a special service truck with an extendible platform for technicians to work from. It’ s quite heavy on maintainance and more expensive for the city than normal busses. But also a thing that distinguishes the place from other cities the people think…. and they can accelerate very quickly which.I personally like.